If you ask me, butter makes everything better. This is especially true when you add fresh herbs + aromatics to the mix, then slather it onto toasted bread or use it as a simple, seasonal sauce atop grilled vegetables, sizzling steaks and seafood. The flavor combinations for herb butters are literally endless – see below for several suggested flavor pairings – and it comes together in less than five minutes. Keep scrolling for the recipe – which, to be honest, is less of a recipe and more of a general guide, so use your imagination!. A quick note when it comes to buying butter… I typically buy Kerrygold salted butter (because let’s be real, salt = yum). The only time I buy unsalted butter is if I’m baking, as most recipes for cakes, cookies, etc call for unsalted. Also! If you’re dairy free, you can totally hop on the herb butter train – use this exact same recipe/technique and substitute with your favorite brand of dairy-free butter. First, make sure that your butter is very soft to the touch. Use a rubber spatula to whip the softened butter together with the herbs (along with the lemon zest + garlic, if using) in a bowl. Add a pinch of salt and pepper and stir to combine. Taste and adjust seasoning as needed. The compound butters can be refrigerated for up to 2 weeks, and will last in the freeze for up to 6 months. See notes above for suggested herb/flavor combinations. It's time you know the truth about pesto. First, you need to know that the word pesto comes from the Genoese verb pestâ (and in Italian pestare), which means to pound or to crush - referring to the traditional method of crushing the ingredients with a mortar and pestle. So while pesto has become synonymous with fresh basil and pine nuts ground together with oil, garlic, and grated parmesan... really pesto is a general term for anything made by pounding. And here's the truth: Pesto need not be limited to basil and pine nuts! Don't get me wrong - that's a fabulous, time-tested flavor combo - but I think we ought to cook outside the box and embrace the wide world of pesto possibilities. If you don't have fresh basil on hand, just about any leafy herb or tender green will do the trick, such as arugula, kale, and radish tops. BONUS: Because these less traditional greens don't oxidize as quickly as basil, your arugula/kale/radish top pesto won't turn brown nearly as quickly. And let's talk about pine nuts. Let's just say that I haven't bought pine nuts in over two years (and I make a lot of pesto)! Instead I use toasted walnuts, which are deliciously nutty, way less expensive than pine nuts, and they are soft enough to blend smoothly with the other pesto ingredients. If you're cooking for someone with a tree nut allergy, just use pumpkin seeds. Don't have Parmigiano-Reggiano? Don't panic. Just about any hard, salty cheese will do. See what I mean? This whole pesto-without-basil-and-pine-nuts thing is quite liberating. To make a flawless pesto every time, just follow my Universal Pesto recipe below, which gives handy guidelines for the (approximate) amount of greens, nuts, olive oil, cheese, and garlic to use. Feel free to go traditional and make pesto in a mortar and pestle... but I'll be honest that I just use my 4-cup food processor and it works like a charm. Pulse nuts or seeds in a food processor until they're completely broken down. Add garlic and olive oil and pulse until garlic is finely chopped. Add the herbs/greens, grated cheese, and lemon juice and process until smooth in your food processor. Stop and scrape down the sides and process again until well blended. Taste and add salt if needed (the parmesan is naturally quite salty, so you often won't need to add much extra salt). To store in the fridge, put pesto in a container and top with a layer of olive oil. 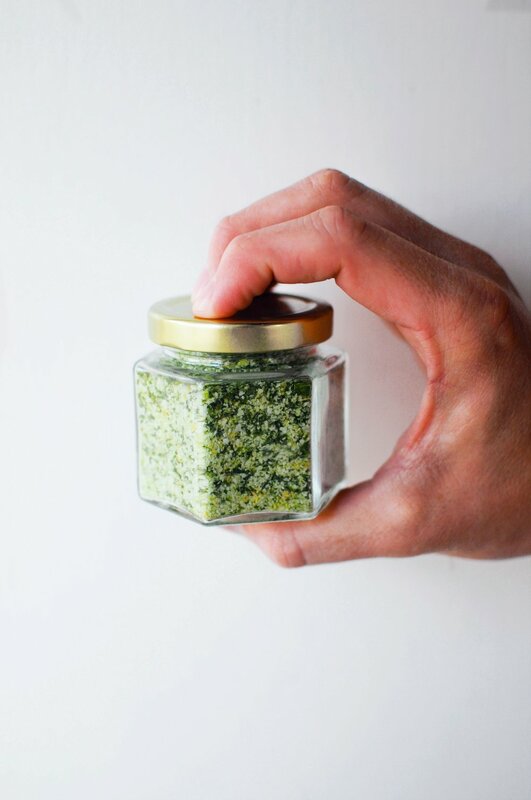 To store in the freezer, scoop the pesto into an ice cube tray and freeze into cubes. When life gives you lemons, you make lemonade. And when life gives you herbs? You make herb salt. As the name suggests, herb salt is literally just fresh herbs chopped together with kosher salt (and sometimes other aromatics like lemon zest, garlic, etc) - and it's a ridiculously easy way to add vibrant, fresh flavors to your dishes. I keep my herb salts close at hand for seasoning meat, fish, and veggies - and it pairs fabulously with eggs, grilled corn on the cob, and homemade popcorn. Keep reading for the full recipe + technique for making your own herb salt, and I encourage you to get creative with the different combinations of herbs you use, and think about types of dishes that will pair well with each blend. Fresh Summer Flavors: Basil, Chives, Dill, Lemon Zest - pair with fresh vegetables, eggs, toasted bread, and fish. Classic Gremolata: Parsley, Garlic, Lemon Zest - pairs nicely with roasted asparagus, grilled salmon, and steak. Savory & Rustic: Rosemary, Thyme, Sage, Garlic - pairs well with roasted root vegetables, potatoes, and roasted pork. Classic French Fines Herbs: Parsley, Tarragon, Chives, Chervil - use with fish, steak, lamb, and toasted baguettes slathered in goat cheese. Cilantro-Lime: Cilantro, Lime Zest, Garlic - perfect for Mexican-inspired fish or steak dishes, corn on the cob, and popcorn. Finely chop all of the herbs, zest the lemon, and mix together in a small bowl. Spoon out half of this herb mixture on your cutting board, then pour half of the kosher salt (about 1/4 cup) on top of the herbs. Chop the salt and herbs together until it forms a consistent paste. Add the remaining chopped herbs and kosher salt to the mixture and continue chopping until the herb salt is evenly blended. Spread the herb salt onto a rimmed baking tray and allow to dry out overnight, or until there is no moisture left (this is important so the herb salt can be stored without going bad). To speed up the drying, you can put the tray of herb salt in your oven on the lowest setting (usually 170F) with the door proped open for 1-2 hours (make sure to watch closely so the herbs don't burn). Store the dried herb salt in a jar in a cool, dry spot in your pantry, where it will keep for several months.